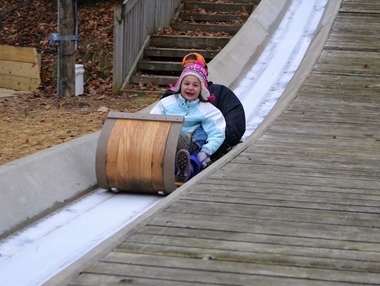 Cleveland Metroparks has opened their Chalet Toboggan Chutes for the season. The first Sunday of the season will see the chutes fully operational and iced. The Chalet offers a complete range of hospitality, from park personnel on hand to help passengers board their toboggan to a warm and cozy place by the fire to relax between rides. The Chutes are a great ride for the entire family. The Toboggan Chutes at the Chalet are the only ice chutes in Ohio. Taking advantage of naturally hilly terrain, they extend 700 feet with a 70-foot vertical drop. Speeds of 45 mph are possible. The Toboggan Run operates independently of the weather. The chutes are iced and maintained at a temperature of around 20 degrees. Gloves are mandatory. The wood toboggans are 8 feet long with a curled front. Each toboggan holds up to four passengers, who are instructed to hold on tight to the person in front of them. Park personnel operate the chute at the loading point. The downhill run is quick, slick and brief. After the descent, the run flattens out, and the chute opens out onto a snowy finish. Then it’s 112 wood steps up to the top of the hill for another ride. The toboggan lift, which carries the toboggans up the hill, is new. In past years, riders were required to carry the 40-pound toboggans with them up the stairs. The Chalet offers a place to warm up before or after a run. There are two wood-burning fireplaces, one indoors and one outdoors, to stand near with the concession’s hot chocolate. Snacks are also available, including fried pickles and quesadillas. Indoors, you’ll find television and the latest video games. Outdoors is a recreational area with a playing field and hiking trail for time-outs from the toboggan run. The Chalet is in the Mill Stream Run Reservation, part of Cleveland’s “Emerald Necklace”. A series of natural preserves, called reservations, are connected by road and trail. The city’s park system has 22,000 acres and 18 reservations. The trail that runs past the Chalet extends for a total of 70 miles, connecting the reservations and providing an extended bike ride or shorter hikes. The trail is hilly and scenic, with waterfalls, fern groves and woodlands. Wildlife abounds. Cleveland Metroparks offers an enormous range of outdoor activities. Traveling through the parks includes biking, boating, cross-country skiing and horseback riding. Archery, fishing, golf and soccer are some of the sports. The park system offers arts activities, nature walks and historical heritage programs. There are plenty of picnic and play areas for family outings. The Mill Stream Run Reservation occupies land in an area settled by pioneers in the nineteenth century. The settlers used the waterpower of the Rocky River and its tributaries for sawmills and gristmills. The area is also peppered with lakes created from abandoned quarries. The local sandstone was prized for use as grindstones.